Embark on a full day city tour starting with the Ho Chi Minh Complex, containing the mausoleum of the nation’s founder Ho Chi Minh, the Presidential Palace, Ho Chi Minh’s house on stilts. Stop at the One Pillar Pagoda, whose origin dates back to the foundation of Hanoi a thousand years ago. Visit the remarkable Temple of Literature, well known as Vietnam’s first university. After lunch, you’ll enjoy the always impressive Ethnology Museum dedicated to Vietnam’s 54 ethnic groups. You'll then continue to the peaceful lake of Hoan Kiem. In front of this lake is the famous Water Puppet Theatre where you'll see a fantastic performance. Arrive at Lao Cai Train station at about 6.30, welcome by our local guide. Enjoy breakfast at local restaurant. After that, we will visit one of the colorful tribal markets near Sapa, and enjoy with a boat triup along Chay river before transferring to Sapa. Breakfast at the hotel and then explore Sapa town. In the afternoon, we take a 2km trek to Cat Cat Village of H'mong Ethnics. Take photos and meet & talk with locals to learn more about their daily life. Then take a drive to Tafin village (12km from Sapa) home to Red Dzao minority. Visit Tafin handicraft shops and explore the daily life of Red Dzao. Take a look at Tafin Cave and a small hamlet of Black H'mong people. Evening is free time. Breakfast at hotel and check out at around 9:00-10:00am. You'll be driven by car to visit Lao Chai village of Black H'mong people. Trek to visit Ta Van village of Dzay ethnic people. Drive back to Sa Pa for lunch at your own arrangement. A short stop in town for shopping before going to Lao Cai station. Dinner at Lao Cai, then take the train back to Hanoi. Travel back to Hanoi by overnight train air conditioned soft sleeper service. The tour continues with a morning spent cruising on to the Man’s Head, Tortoise islands and then Luon Cave by small bamboo boat. After brunch travel past Bai Tu Long to Bai Chay to disembark. Meet your driver and guide to transfer you back to Hanoi and fly to Hue (option to travel by train to Hue), on arrival in Hue, you are transferred to the imperial city of Hue. In the morning embark on a boat cruise in the scenic Perfume river to visit Thien Mu Pagoda. Continue by road to Tombs of King Minh Mang & King Khai Dinh. After lunch, visit the Imperial Citadel where Kings of Vietnam’s last feudal dynasty ruled from 1802 to 1945, including Flag Tower, Nine Holy Cannons, Ngo Mon Gate, Thai Hoa Palace, Nine Dynastic Urns, Forbidden Purple City, etc and Dong Ba Market. Overnight in Hue. You are driven south to Hoian, which was originally a Cham seaport but has been influenced down the centuries by traders from various cultures. The scenic road is hugging the coastline before crossing over the winding Hai Van pass. A view from the top of the pass is one of Vietnam’s most impressive panoramic scenes of Lang co Beach. You stop en route to visit the Cham Museum in Danang City, China Beach and the Marble Mountain, whose peaks represent the five elements of the universe. The ancient architecture of Hoian is a fascinating combination of Vietnamese traditional buildings with Chinese and Japanese influence. There’s plenty to see in this delightful town, some of which are the famous Japanese Covered Bridges, Pottery Museum, 200 years old Tan Ky House, Chua Ong Pagoda and vibrant market. Today we include these on a walking tour past many low tiled houses scattered along the small streets and assembly halls, which reflect the town's multi-cultural past. You’ll understand why many visitors come to Hoi An again and again. In spite of the beautiful setting, many visitors site the food as the highlight of their trip to Hoi An – ask your guide for a recommendation! There is some free time for your own exploration in Hoi An until we transfer to Danang airport for flight to Ho Chi Minh. Depart Danang: 1330 Arrive Ho Chi Minh: 1440 On arrival, you are met and transferred to your hotel. On arrival city you're free to relax in the afternoon back in HCMC, may to do some final shopping or visit the famous Cholon local market. Visit the main attractions in Ho Chi Minh City, beginning with the Reunification Palace, which was the former residence of the Southern Vietnam President until the end of April 1975, learn about the history of the Vietnam War from the Vietnamese perspective at the War Remnants Museum before having lunch. After your own lunch you'll be driven to the Cu Chi Tunnels, an incredible underground network of approximately 200km constructed by Vietnamese fighters during the long struggle for independence. The tunnels contained hospitals, accommodation and schools, and were used as a military base for the Viet Cong in the American War. 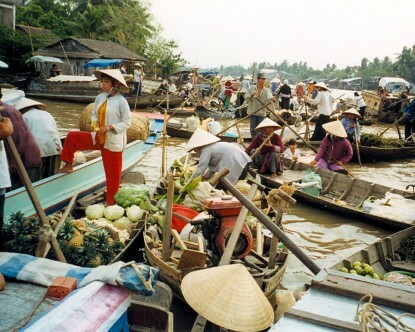 Coach trip to Cai Be, 2.5-hour drive from Ho Chi Minh City, take a boat trip along the Mekong River to view the daily life of local people who work and play on the waterways of the Mekong Delta. The trip includes a visit to canal where the floating market at Cai Be takes place, and to a family-run business producing rice paper and corn flakes of Vietnamese style - a key ingredient in Vietnamese cuisine. Lunch at local house set amongst fruit orchards and bonsai trees. A performance of traditional Vietnamese music accompanies the meal. Return to Ho Chi Minh City in late afternoon.